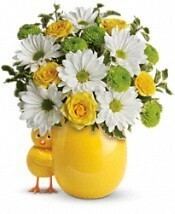 An absolutely adorable keepsake, this Happy Chick is guaranteed to make everyone smile. 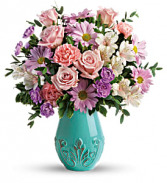 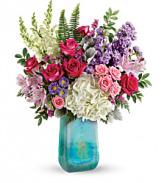 White hydrangea, hot pink roses, pink spray roses, light pink alstroemeria, white snapdragons, lavender stock, lavender matsumoto asters and raspberry sinuata statice are arranged with dusty miller, leatherleaf fern, sword fern, and huckleberry. 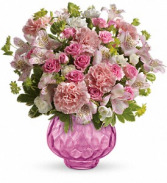 Delivered in an Art Glass Treasure vase.